Astro Pi: Launch is tonight! Tonight, two specially augmented Raspberry Pi computers, called Astro Pis, will launch into SPAAAAACE! The Astro Pis will be running experimental Python programs written by school-age students, where the results will be downloaded back to Earth and made available online for all to see. If you’ve been following the Astro Pi project, you’ll know that we were bumped from Tim Peake’s launch vehicle due to a cargo overbooking back in October. We’re now going to launch on Orbital Sciences’ Cygnus cargo freighter (an unmanned spacecraft, above) on its fourth supply mission to the ISS. 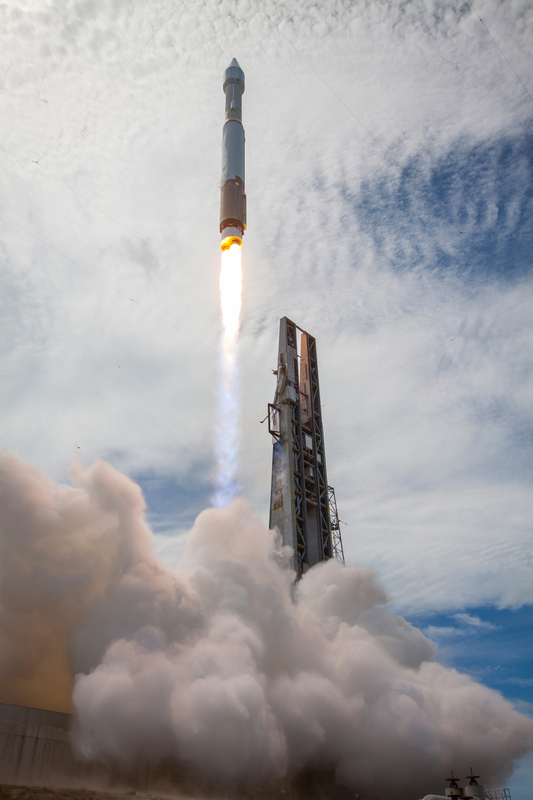 Orbital Sciences have contracted ULA to launch it into space on an Atlas V rocket (below). When you need to rendezvous with an object in orbit, the timing of the launch is often critical to ensure that you get into the right orbital trajectory. This is often achieved with an instantaneous launch window where the rocket has to lift off at a precisely calculated time, otherwise the two objects will never meet in space. Obviously, this approach can significantly limit the probability of an on-time launch. For instance, you may need to wait for a rain shower to pass by, a technical problem to be resolved or a boat in restricted waters to be chased away. However, this is not the case for our launch! The Atlas V has so much performance capability that it provides a 30-minute launch window each day, and it’s all thanks to energy. 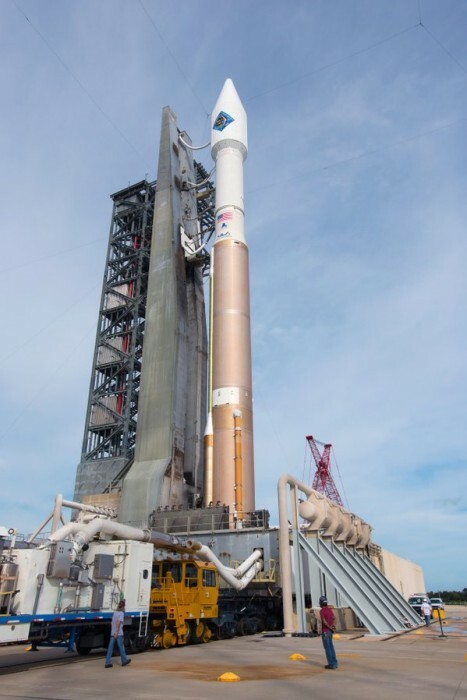 The Atlas V has so much available energy that it can accommodate a very large off-nominal time of launch: 15 minutes early or 15 minutes late. The extra power is then used by clever steering algorithms to compensate for the rotation of the Earth, relative to the orbital target. 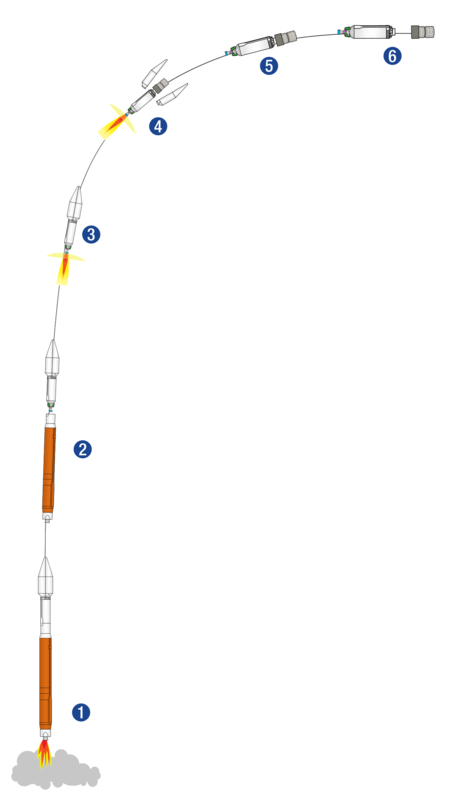 Below is the final configuration of the rocket. It will fly in the 401 vehicle configuration with a four-metre fairing, no solid rocket boosters, and a single-engine Centaur upper stage. The Astro Pis are sitting inside a small cargo transfer bag within the Cygnus spacecraft at the top. And here is the ascent profile, with the main events numbered. 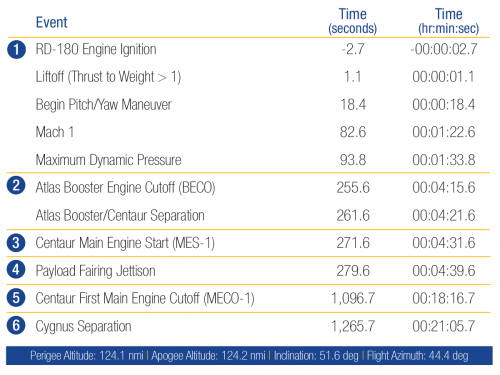 These are the event descriptions, with their times relative to lift-off. And finally, this is the ground trace; note that it will pass over the UK around 23 minutes into the mission. However, it will be in the Earth’s shadow and so almost impossible to spot with the naked eye. If everything goes according to plan, the Cygnus spacecraft will arrive at the ISS on the 6th of December at 9:00 GMT. The docking is a fascinating process and really worth watching if you’re interested; NASA TV will show it. It involves one of the crew operating the Canadarm2 to grab onto the incoming spacecraft before pulling it in. Cygnus being moved onto the pad yesterday – the two Raspberry Pis are in the cone at the top. 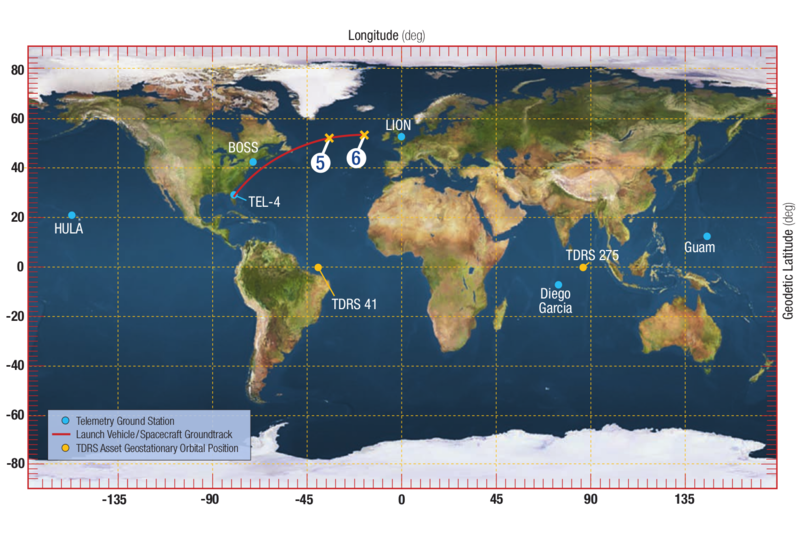 If it’s delayed to the 6th, it will have to loiter in orbit for a few weeks before it can dock with the ISS. This is because of other visiting vehicle traffic, such as the Soyuz 45S launching on December 15th, carrying Tim Peake and his crew mates. I will be attending the launch at Kennedy Space Center, along with Matt Richardson and Jonathan Bell (AKA jdb on the forums). We will be live-tweeting from our personal Twitter accounts (@Dave_Spice and @MattRichardson), from the Raspberry Pi account and also from the main Astro Pi account. Please follow the official Twitter account below for the very latest updates on the launch. This has been a long road for us and our partners, so please keep fingers and toes crossed! Hopefully I should be able to watch this on a Raspberry Pi with the Kodi NASA TV plug-in. The countdown has to reach Zero before you can lift off. Hope it goes well. Looking forward to photos/vid. Should’ve added a command to watch this live on the pi. What’s the backup plan if this rocket launch fails or blows itself to smithereens? After all, it only took a few MONTHS!! The link to the main raspberry pi twitter account is misspelled: */Raspberry_P –> */Raspberry_Pi. I am so excited… I’ve said it before and I’ll say it again! Code I wrote in on that bad boy! There is just so much potential for education and getting kids excited in the sciences with something like this. Can’t wait till they are in operational status on the station and sending data. Kudos to you guys for maintaining your vision and actively supporting such scholastic endeavors. This is one of the reasons Raspberry Pi’s are popular, not only because they are great products in themselves. It feels good buying them knowing that proceeds from sales actually go to such programs. So excited that I get to watch this from my backyard! Hopefully the wind dies down a bit and the clouds open up. This is going to be a great launch! …the anticipation is killing me… can’t one of you clever people create a fleet of RPi drone – cloud n rain removers?! …never mind, another day tomorrow and 23 hours for the Pi community to get those cloud removing drones, designed, manufactured and dispatched! If any one can, Pi community can! …and a giant wind break?! Over 10k viewers. I wonder howmany without the pi’s on board. Stayed up till wel over midnight ( holland ) to see it go … well it did’nt. Tommorow is another day …. Let’s all keep our fingers (and toes) crossed that the weather doesn’t scrub tomorrow evening’s launch window too (Friday 22.33hrs)…. Friday 22.33hrs GMT = Saturday 09:33hrs NZDT. I’ll be watching NASA TV’s Live feed. Sorry, timezones are always confusing. It’ll be 11:33 NZDT, with NZ 13hrs *ahead* of GMT. Wow! I still can hardly believe that a credit-card size computer made by a small non-profit organization is going into space! This must be a huge factor of excitement among the pi foundation. To the pi foundation, let’s give a cheer! Also, what is the time in U.S. central? Time is really confusing. Looking for Sputnik (so small and invisible but the booster and fairing were visible) in Oct 1957 with my Grampie, made a lasting impression on a 7 year old boy. Visit http://www.n2yo.com for the best tracking (as I type the ISS is just going over me in nodnoL (Red Dwarf) and reaches most northerly inclination over Chingford.) Obviously the sats are not visible during the day, and must be in sunlight while (whilst? been away for 56 years) the observer is not. Funny how the US use countdowns – eg: T Minus 15 minutes, whilst the Russians simply say GO at the right time, irregardless (not a word) of a 30 minute launch window. now I just see two guys talking….. is the launch still on today? No. It was scrubbed, they will try again tomorrow. Even rockets have to give way to the wind. Hopefully tomorrow; but only a 30% probability of favourable conditions. The next launch attempt will be on December 5, 2015 at 5:10 p.m. Eastern Time – your time zone may vary! The launch window is 10 minutes wide (+/- 5 minutes). 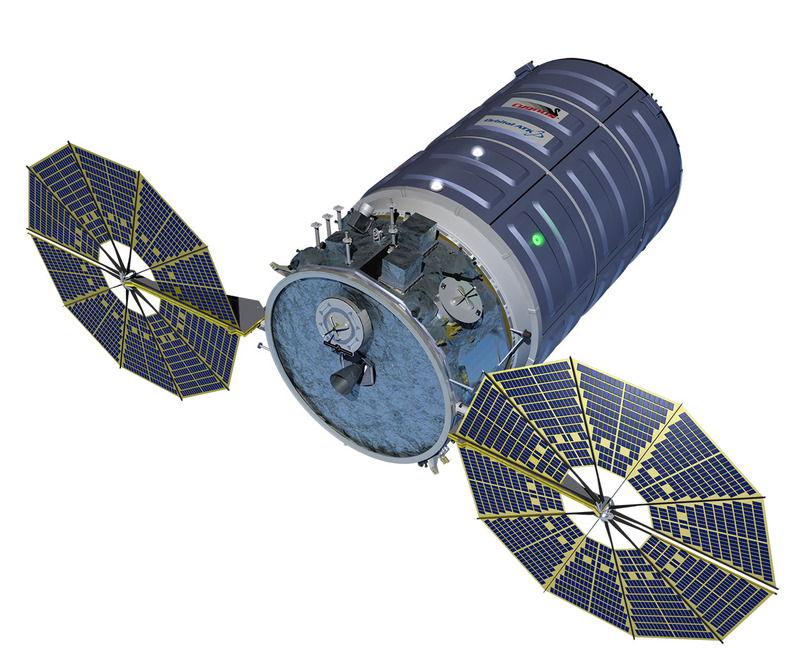 The launch of Orbital ATK’s Cygnus cargo spacecraft to the International Space Station has moved to Sunday at 4:44 p.m. EST, the start of a 30-minute launch window for the uncrewed spacecraft to begin it mission. Countdown and launch coverage will begin here on the NASA Blog and on NASA TV at 3:45 p.m. Saturday’s attempt was called off because of high winds that were expected to violate launch criteria throughout the 30-minute launch window. The weather forecast for Sunday improved to a 40 percent chance of acceptable conditions at launch time. Launch scubbed again. Next attempt is scheduled for 2015-12-06 16:44 EST. Could someone please give me a current update? Oh, I got it now, tomorrow…..
A good satellite tracker is GPREDICT for the Pi. Menu – Education – GNOME Predict. Edit – Preferences – check Show Local Time…then Ground Stations – Add New – Name (Cape) – Select (US – Florida – Nasa Shuttle) – OK, check Cape as Default. Include your own location in the same manner. Shutdown and restart gpredict. Use your own location for exact local predictions. Use Cape only for launches. Now you are A-OK and ready to go! The launch of a new satellite takes place before the ISS directly goes over the launch site ie. the launch window. Stick a date on your blog posts. From the homepage ‘tonight’ is not obvious. So I entered the post to read it. No post date at the top or bottom. Holdon … something has changed ….. can someone update the title now :-). There is a date in the top-right “Posted by” box – it says this blog was posted at “3rd Dec 2015 at 11:34 am”. But that box automatically disappears if your browser window isn’t wide enough. did anyone notice a baseball bat on a desk on in the iss control center? So far all is progressing well. Cygnus cargo-delivery freighter now successfully separated from booster and off under its own power to RV with the ISS. anyone knows if the delay and the extra delay because docking has to wait for other spacecraft is going to affect deployment date or experimentation time ? No, not at all – Tim himself doesn’t get up until Dec 15. I sat through the last two launch windows, which were both scrubbed. Had to go out, and missed the live launch tonight by ten minutes. The replays of the various camera positions was worth watching.It’s hard to believe that It’s gone from a prototype, to a ride to the ISS in a few short years. Through hard work to the space pi. A. Put Two Pi’s around it. Huge congratalutions to all involved, and fingers crossed for Tim and his crew. Final preparations with the Astro Pi units. They launch in 10 weeks!